Police in Japan say they have found evidence of match fixing in the sport of sumo wrestling. Various Japanese media outlets are reporting that text messages detailing thrown matches were found on the phones of several wrestlers. The phones were confiscated during an investigation of the sport’s second division. Dozens of sumo wrestlers were investigated after being implicated in a gambling scandal. According to media reports, the sumo wrestlers became involved with organized crime after losing large amounts of money betting on Japanese baseball games. People magazine has photos of actress Diane Keaton being injured and taken away from the set of a movie she was filming. Keaton sustained the injuries in a mock bout with a sumo wrestler. There’s a huge controvery currently sweeping the sports world in Japan. The story is all over Japan’s newspapers and television. The scandal involves sumo wrestlers and golf. Get your mind out of the gutter. Whatever trouble you’re imagining they could have gotten into, Asashoryu and Hakuho didn’t do it. The “scandal” is that they were even playing golf at all. Apparently, a group of sumo wrestlers hit the links just two days before a major sumo tournament. 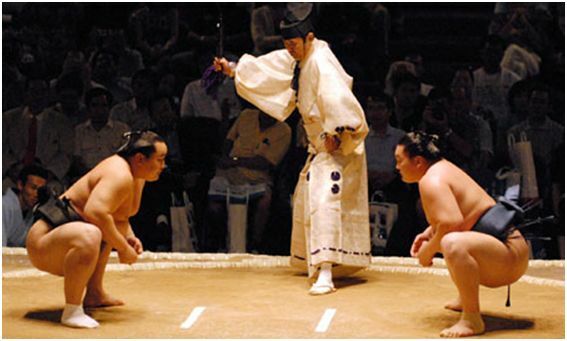 In Japan, sumo is a centuries-old, ritualistic tradition that borders on religion. You can read more about the scandal on the website cibersumo.com. A pair of sumo wrestlers have tested positive for marijuana use according to the Japan Sumo Association’s anti-doping panel. 69 Japanese sumos were ordered to undergo drug testing after a Russian wrestler was given a lifetime ban for being arrested on suspicion of possessing marijuana. Both of the wrestlers who tested positive for marijuana were also Russian. According to the International Herald Tribune, “Sumo culture is conservative and its wrestlers are generally held to a high moral standard.” Not only do the wrestlers who tested positive for pot face supension, but they can also be deported or given lengthy prison sentences. You are currently browsing the archives for the sumo wrestling category.